Tiger Giving Day is an annual event during which the Auburn Family is encouraged to offer support to projects they care about throughout the university. The College of Sciences and Mathematics (COSAM) has several worthy projects this year, and COSAM alumna Audrey Goins Cormier is encouraging others to support one that she considers life-changing for students. The STEM GLIDE (Global Learning Immersion for Diverse Experience) Program offers students the opportunity for interdisciplinary learning about water quality while enhancing their cultural awareness during a study abroad experience in the Dominican Republic. Cormier personally experienced a similar program, traveling to Ecuador and the Galapagos Islands as a graduate student in 1975. The late Dr. George Folkerts, her professor in the Department of Biological Sciences, led the trip. “Dr. Folkerts was big on field trips and this was the field trip to end all field trips,” Cormier said. It was the first time out of the country for Cormier, and she said it was one that forever changed her life. Cormier graduated from Auburn in 1974 with a Biomedical Sciences degree and in 1976 with a Master of Zoology. She spent 39 years with the Chevron Corporation, and retired two years ago as the diversity and inclusion manager. Cormier has contributed $3,700 to make it possible for a student to have the STEM GLIDE experience and has endowed a scholarship in COSAM. She is hoping to encourage others to support the GLIDE Program this Tiger Giving Day. “If this trip can inspire students to see another part of the world and see other cultures and appreciate what other cultures have to provide, in terms of not only the environment but the way people live, I think it will broaden their view and make them more inclusive in their thinking, not only about science, but other people and other cultures,” she said. This Tiger Giving Day, COSAM also has additional projects including a project to replace the bridge in the Donald E. Davis Arboretum. The current bridge is too narrow for more than one person to cross at a time, and also requires upgrades to bring it to ADA compliance. The new bridge will be constructed of a composite wood material, made up of byproducts of the sawmill industry and recycled plastic. Combined, these create a longer lasting wood-like material and serve as an educational tool to highlight the benefits of recycling during outreach programs. Arboretum Curator Morgan Beadles hopes that the bridge, which would be installed during the 2019 Fall Semester, could be constructed as a class project for the McWhorter School of Building Sciences’ Service Learning Class. “This will also allow the students in this class an opportunity to leave a lasting mark on Auburn’s campus that they can continue to visit for years to come,” Beadles said. Another project in conjunction with COSAM is fighting drug-resistant bacteria with dirt. This new equipment, a freeze dryer, will help COSAM researchers process a greater number of samples more quickly, allowing the development of new antibiotics more rapidly. Donations will further COSAM’s efforts to fight drug-resistant bacteria and bring new drugs online more quickly since bacteria have become better at resisting the drugs we use to treat them. In fact, each year the Centers for Disease Control estimate that more than two million people become infected with antibiotic-resistant bacteria, and at least 23,000 people die. Tiger Giving Day is Thursday, February 21. To give, visit TigerGiving.org. 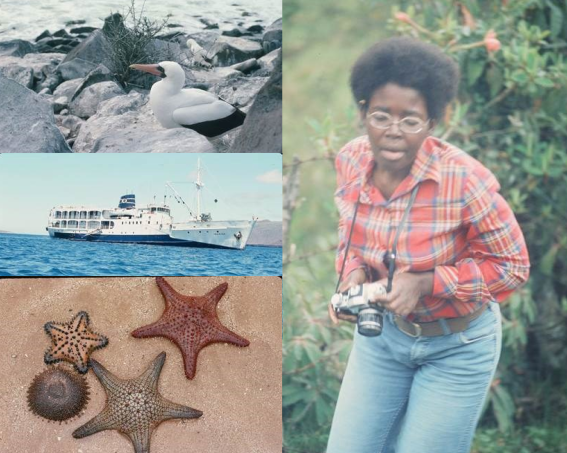 COSAM alumna Audrey Goins Cormier during a trip to Ecuador and the Galapagos Islands as a graduate student in 1975.